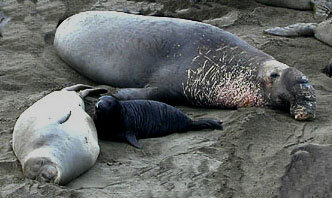 The elephant seal is a true seal (Family Phocidae) with a unique change in the males as they mature. The males develop a large (almost trunk-like) inflatable nose and look very different than the females … thus the name "elephant" seal. There are two species in the world - one in the northern hemisphere (the northern elephant seal, or Mirounga angustirostris) and one in the southern hemisphere (the southern elephant seal, or Mirounga leonina). The northern elephant seal is found primarily on islands along the coast of central and southern California (USA), the west coast of Baja California (Mexico) and a few mainland areas in this range. They come ashore in this range to reproduce during winter months and then again to molt (shed their fur) during summer months. They forage out to sea in the Pacific Ocean for thousands of miles near these areas when they are not ashore. 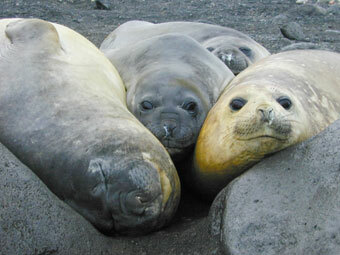 The southern elephant seal, the larger of the two species, is found primarily along the coast of Antarctica, the tip of South America and the islands in this area. Both species are deep divers and feed on fish, cephalopods and crustaceans in the water column. They make long migrations twice a year - once to molt (shed their fur and regrow a new coat) and once for reproduction. Molting generally occurs in summer months and reproduction occurs in winter months. 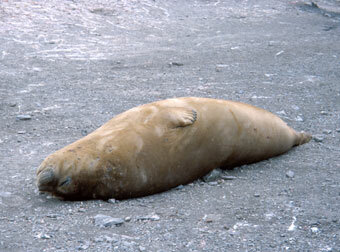 Thus, the southern elephant seal is molting in December/January (the southern hemisphere summer) when the northern elephant seal is reproducing. And, the southern elephant seal is reproducing in June/July (the southern hemisphere winter) when the northern elephant seal is molting.